PROSERPINE (ARL-21) was laid down as LST-1116 by Chicago Bridge and Iron Company, 2 October 1944; launched 28 December 1944; and commissioned 9 January 1945. After dry docking in Mobile, Alabama, LST-1116 commenced shakedown in St. Andrews Bay, Florida, 31 January 1945. 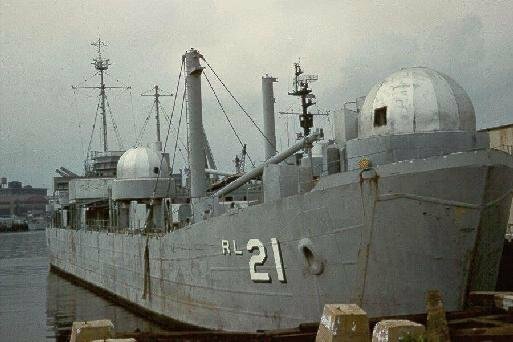 She then decommissioned 15 February at Gibbs Gas Engine Company, Jacksonville, Florida, underwent conversion, and re-commissioned as Prosperine (ARL-21), a landing craft repair ship, 31 May 1945. Assigned to Commander. Amphibious Force, Atlantic for shakedown, Prosperine operated out of Hampton Roads, Virginia, from 14 June to 6 July. Thence passing via the Windward Passage and the Panama Canal, she called at San Diego, California, 4th August. Three weeks later she was at Pearl Harbor. From there she went on to provide mobile repair services at Eniwetok through 16 September, at Guam through 6 October, and at Leyte, Philippine Islands through 1 April 1946. 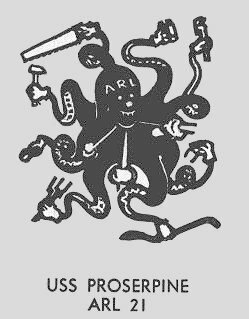 By the end of April 1946, Prosperine stood out of Pearl Harbor and proceeded via the Panama Canal, Houston, and New Orleans for Mayport, Florida, arriving there 1 May. She decommissioned and was placed in reserve at Green Cove Springs, Florida, 18 January 1947. Reactivation of Prosperine commenced 19 September 1950, and she recommisioned 27 October 1950, Lieutenant Commander J.B. Darrow in command. She entered dry-dock at Merrill-Stevens Shipyard, Jacksonville, Florida, 21 November, after which she commended refresher training in Chesapeake Bay. Prosperine returned to Little Creek, Virginia, and commenced repair activities 1 April 1951. Through 1955, she operated at the Amphibious Vase, Little Creek, Virginia, with regular training cruises into Virginia Capes Operating Area, and periodic short deployments to the Caribbean. Placed in reserve at Little Creek 15 February 1956, she decommissioned 24 May and remained in reserve until sold 26 September 1960 to Interamerican Standard Company, New York.